More than 15 children and their families enjoyed the Christmas of their dreams Tuesday afternoon as the third-annual Jingle Jet completed another successful flight to the North Pole. Jingle Jet was founded in 2006 by radio personality Tony Zazza as a way to give five local families in need a holiday experience they would not otherwise had. Tom Hicks, owner of the Dallas Stars and Texas Rangers, donated the teams’ private jet as transportation to the “North Pole”. Upon arriving, the families were greeted by none other than Santa and Mrs. Claus. Each family had a designated Christmas tree surrounded by wrapped presents and the Stars wives, along with players Mike Modano, Toby Petersen and Trevor Daley, were there to welcome the families and share in the holiday joy. After opening their presents, the children had the chance to enjoy everything else the North Pole had to offer: live reindeer, face painting, balloon animals courtesy of Santa’s elves as well as photo opportunities with Santa and Modano. 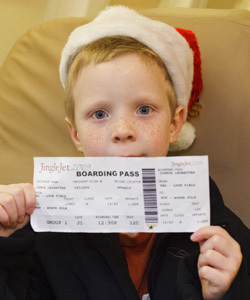 Jingle Jet asked the families for Christmas wish lists but were given little information as to why it was needed. Families requested clothes and toys for their children, but everyday household items were also on the list. The Budge family received a basket of necessities, which included items as simple as tissues and mail envelopes. Mother Claudia Budge broke down in tears after unwrapping a vacuum cleaner. Heidi Fisher nominated the Budge family because of their continued commitment to their community despite their own financial struggles. Both parents are teachers and have limited incomes. Their youngest child was clipped by a car, hit her head and has suffered seizures since, making health expenses unbearable. To be able to help bring a memorable holiday experience to the Budge family brought tears to Fisher’s eyes. The ultimate winners of the afternoon were the children. Seven-year-old twins Josh and Zachary Ledbetter were in awe of their entire Jingle Jet experience. The Ledbetter family actually received four separate Jingle Jet nominations from four different individuals. The boys lost their younger brother, Caden, in September after a two-year battle with Neuroblastoma. The family lost their grandmother earlier this year as well. The medical expenses combined with home repairs from water damage erased any finances to provide Christmas for the twins. Tuesday’s trip to the North Pole not only helped to lessen the financial stress of the Ledbetter family, but it also allowed the boys to have an unforgettable Christmas experience. The Stars’ wives and girlfriends took on this project as part of their community outreach. They became very attached to their families throughout the entire Jingle Jet process. After nominations closed Nov. 30, the stories of every nominated family were read and five lucky families were selected to visit the North Pole. The wives were split into five groups and were given a family. On Dec. 15, the wives joined Tony Zazza and the nominators of each family to go shopping for presents. This year, unlike previous years, it was entirely up to the wives to fund the Christmas experience for their selected family. The ladies did not disappoint as they were eager to find outfits in just the right sizes and colors as well as toys the children wanted. This event would not have been possible without gracious sponsors Zazza Media Strategies, the Dallas Stars, Bill Reed, O2Kool Entertainment, Quest Drape, NoFrills Grill, the Texas Rangers, Hansen Video, Jesuit Baseball, Anderson Crenshaw & Associates, and Metroplex Baby.